So glad you liked the idea yesterday of how to make your salad and other produce last longer in your fridge! The jars and sealing system are definite must haves in my kitchen, which means they've really earned their keep. I try to keep my kitchen as minimalist as the rest of my house, so I'm not big on keeping around gadgets that don't get a lot of use. Kitchen cabinet space is prime real estate, of course, and you gotta earn your keep if you want to live in there. I'm getting more into cooking now and don't mind investing it good pieces, since we finally don't plan on moving (I did the math, I've lived in 11 different places since I moved to college at 18 until we bought this house when I was 31.) 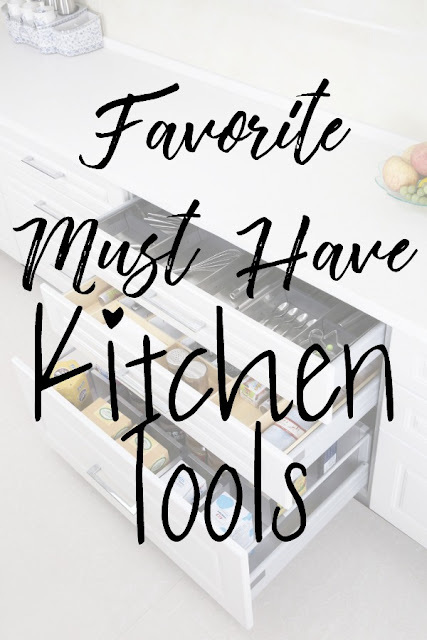 I thought today I would share what else is currently among my kitchen favorites. Coffee Maker. Not only is this a kitchen must have, it actually sits out on the counter all the time. There's not a single other thing out on my kitchen counters because I believe in keeping them clear. It looks neater and it's easy to cook and clean if there's not crap all over the place, so I recommend only keeping things out if you use them every single day. For us, that's only the coffee maker. The coffee maker is also our favorite way to make hot water for tea, and we both have tea almost daily as well, so it's the most used item in the kitchen. Crockpot. Although it's not a daily use item, it's at least a weekly item, more in the fall and winter. I have a post coming up soon about how I make a week's worth of breakfast for John in the crockpot on Sunday morning, and then wash it out and use it right away to make ribs or chili during football season when he has his dad and brother are over every week. It totally makes me look like the ultimate homemaker, for very little effort. Big Coffee Mugs. Mine are from Crate and Barrel and I love them. Extra large coffee mugs are so important in our house, we each use at least 2 a day. The large size is great for coffee of course, but it makes it suitable for things like soup too. I know people like their kitschy collectible mugs, but I'm a streamlined kind of girl so I enjoy the matching set and the look of the clean white porcelain. Smooth Edge Can Opener. I already mentioned this in a three on Thursday post, but it's really nice. I had to open a can of dog food when I was at my parents' house last week with their regular can opener and (a) I almost forgot how to use it and (b) I forgot how gross it was to have to deal with the lid of the can. The smooth edge opener goes around the entire top, inside of around the inside rim, so the top lifts off in one piece and doesn't drop inside of the can. My opener also has a little clip thing on the outside that I can press a button down to clip onto the lid and pull it off to throw away, never having to touch it with my fingers. Food Processor. I am super, intensely lazy when it comes to meal prep on Sundays. There's just a lot of different dishes I'm making so the last thing I'm wasting my time on is chopping vegetables. So I use a food processor. Huge ones exist so you can do a lot at once, but this small one is cheap and works well, and doesn't overload my cabinet when it's not in use all week. The different blade attachments have different functions, so I can shred cabbage, cut carrots into strips, make guacamole, it's fun and convenient. Baking Dishes. I really like baking dishes for making casseroles and my famous taco dip at parties, but even more than that I like bringing them to my mother's house because she fills them with stuffed shells and sends me home. Winning. I have two sizes of Le Creuset ones that were a gift from my mom plus a glass pyrex one with a lid. As far as dessert type baking dishes? A cupcake tin with a carrying lid since I make them fairly often, and a baking sheet. Immersion Blender. I dislike the weight and cleanup efforts required with a regular full-size blender. Since we aren't really smoothie people, the immersion blender is perfect. It's a little handheld gadget and the blade part pops right off to go in the dishwasher. John loves it for making mashed potatoes, oddly enough. Peeler. I'm fine with the skin on some things, but not carrots. They're too dirty. And it's actually the one thing John is allergic too, the pesticides but only on carrots? It's the strangest thing, I know. Anyway, I buy them organic, wash them, AND peel them, and then he's fine. Garlic Press. I think garlic is it's own food group in my diet, I could (and do) eat it by itself. So a press gets used fairly often around here! Oven Liners. John insists on making pizzas without anything underneath, so oven liners are must to catch everything that falls. Way easier than constantly cleaning it. Cutting Boards. Wood for vegetables, plastic for meat so it can go in the dishwasher. Colander/Steamer. We make a lot of pasta so we obviously need the colander. But it also doubles as a vegetable steamer, so I really like that two in one function there. Bottle Opener. No explanation necessary. I'm still waiting to get pots and pans, which is why they aren't on this list, but Calphalon was the clear winner when I asked for recommendations on that front a few weeks ago. I'll keep you updated when I get some for myself. What are you kitchen must haves? Any favorites that are missing from my list?